R and R is the perfect place to rest and relax on Lake Superior's North Shore. Located near the town of Lutsen, this log sided cabin is the perfect northwoods getaway. R and R is a 3 bedroom, 1 bathroom Lake Superior home in Lutsen, MN. This Lake Superior cabin is a great place to relax and enjoy all that the area has to offer. Enjoy 500 feet of private Lake Superior shoreline during your stay. There`s seating for six at the dining room table which opens into the living room. The cozy living room/dining room has room for everyone to curl up and relax. The fireplace has been converted to gas and is a great place to curl up in front of on a cold evening. With the semi-open living space you can move easily from the living room into the dining room and kitchen area. The full size kitchen is a great place to prepare meals during your stay. The first bedroom has a full size bed. The second bedroom features twin bunk beds. The third bedroom also has a full size bed. The single bathroom has a shower/tub combo. This small, cozy, lakefront cabin is perfect for a Lake Superior getaway. The large deck has amazing views of Lake Superior. Beach access is down a small flight of stairs. Looking east toward the town of Lutsen on your own little slice of paradise. Looking west toward the town the Tofte, you can often catch a beautiful sunset on this part of the shoreline. The firepit is a great place to relax and share your Northshore adventure stories. Just the kind of place that comes to mind when you think of the North Shore. This cozy log-sided cottage has 3 bedrooms and 1 bathroom, well-equipped kitchen, and a private setting on 500' of Lake Superior shoreline. This cabin is one story with easy access. Rest and Relax while you spend hours daydreaming on the large lakeside deck, reading or watching the sunrise and sunset from the shore. 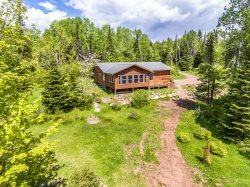 Located just a mile outside of the town of Lutsen and a quick drive to Lutsen Mountains, R and R has a great central location to many year around activities. The Lutsen area offers everything from miles of hiking and biking trails, in addition, the Mountain itself. Head up during the summer months, as well, to enjoy the alpine slide and take a scenic gondola ride up to Moose Mountain Summit where you can enjoy breathtaking views of Lake Superior. Cascade State Park is just 10 miles away and features a gorgeous waterfall following a short, easy hike. You are also just a short drive away from many restaurants (some only open in the summer months) and quaint, locally-owned shops located nearby in downtown Lutsen and Grand Marais. After a long day of exploring the North Shore, come back to your home away from home and enjoy a fire near the beach. Roast marshmallows with your friends and family and reflect on your Northwoods adventures. If you came to R and R just to relax, then you've obviously come to the right place, as well! Just as the name suggests, R&R has a peaceful serenity to it that will leave you relaxed and rejuvenated after your visit. So consider making R and R your home away from home on the North Shore. Pets are welcome with prior approval. 2 pet maximum. We have stayed here before and we love this place! The location is very secluded and private. We didn't see or hear anyone else. It's a cozy cabin and very comfortable. They installed a gas fireplace since we were last there.I missed the wood fireplace, but I can see why they put in the gas one. We love R & R - this was our second time there and we are returning in October for two weeks. The location, so close to the lake and close to Lutsen and Grand Marais, is wonderful. The deck is just outstanding - the best deck we've seen in staying on the North Shore for over 25 years. The gas fireplace is a nice change as far as ease of having a fire but we missed those roaring real fires in that huge and beautiful fireplace. I am a pottery lover and the dishes are so beautiful and such a pleasure to use. The only suggestion we would make is it would be nice to have a queen size bed in the larger bedroom. Easy booking as always. The R&R was our favorite cabin so far and we have stayed in perhaps four of Cascade's cabins that allow pets. The cabin was clean, the furniture was COMFORTABLE, the view stunning the fireplace warm and easy to use. The kitchen was well set up and we had everything we needed with one exception - some tissues would have been awesome! That is sort of a joke but it was the time of year for tissues and the cabin was tissue-less! There was nothing we didn't love about this particular cabin and we will be back - we even stayed an extra night. This is our second time staying at this cabin. Love the location with beautiful view of Lake Superior and it is just across the road from Lutsen Ski Resort - restaurants and entertainment. There is really nothing we dislike about the cabin. While it doesn't have a television, it provides us dedicated time to converse with each other, play board games, read books, and listen to the radio. R&R has been our vacation goal for the past 10 or more years. Oh, what an improvement to king's x the attempt to keep the wood burning fireplace! We love birch fires, but they just were not working any longer. I hate to talk up this cabin because every time I get a chance to " slip" up (680 miles) it is rented, so we book a year ahead. The solid booking from month-to- month says it all: private, off the roads, great place for dogs, everything you need, nice but not too fancy or breakable. Cascade staff turns over the cleaning from one party to the next so nicely you feel you are walking into your own cabin. Only stay here if we don't wish to! This is the fourth year that we stayed in R and R. We love everything about the house and the location. The huge deck, the accessible shore line, the layout of the house. The rental staff was extremely helpful as always. We missed the wood burning fire place, but gas is nice for a lot of reasons. Loved the home! The location and privacy were just what we were looking for. It had everything we needed. We were glad that there was no TV,it's too easy to turn on out of habit. What we liked best was the privacy and that we could bring our dog. We loved how close it was to all the hiking trails. It was nice to have the firewood for the fireplace. We have been coming up to the North Shore for more than 25 years and R & R is my favorite cabin by far. It's cozy and comfortable, beautiful lake shoreline, amazing deck that goes right up to the edge of the land, huge and wonderful stone fireplace in the living room with all the wood you could possibly need, huge windows that bring views of the lake into every room, great location in that it isn't too far from Grand Marais and thus we could take in some of the live music there. We loved the beautiful pottery dinnerware and the huge long table where we could stretch out our books and journals. And it is so private. The perfect spot on that amazing lake.